Boney, Janhvi and Khushi received Sridevi’s Best Actress National Film Award for Mom in Delhi today and for the ceremony, the ladies kept it traditional with Khushi wearing a lehenga by Manish Malhotra and Jhanvi picking a sari from her Mom’s collection, one that the latter wore to Ram Charan’s wedding back in 2012. This couldn’t have been easy for them. Our best wishes always to the girls! These kids had to grow up and maintain a “public” face so soon, it is heartbreaking. 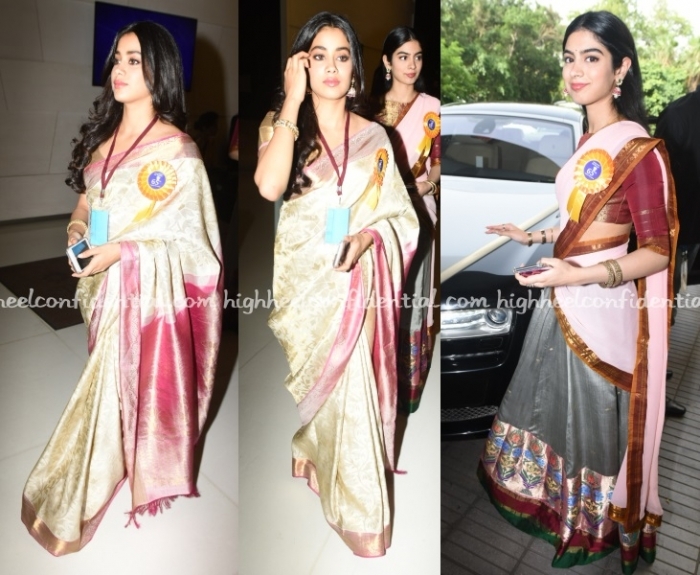 Missing Sri even more now…Jhanvi looks poised and sweet but that saree looked phenomenal on Sri. well done, both these young women, for representing their mother with grace and style. It’s so hard to lose a parent, and to do so in the public eye is doubly difficult. They chose their clothes with thought and care, and that deserves a lot of praise. 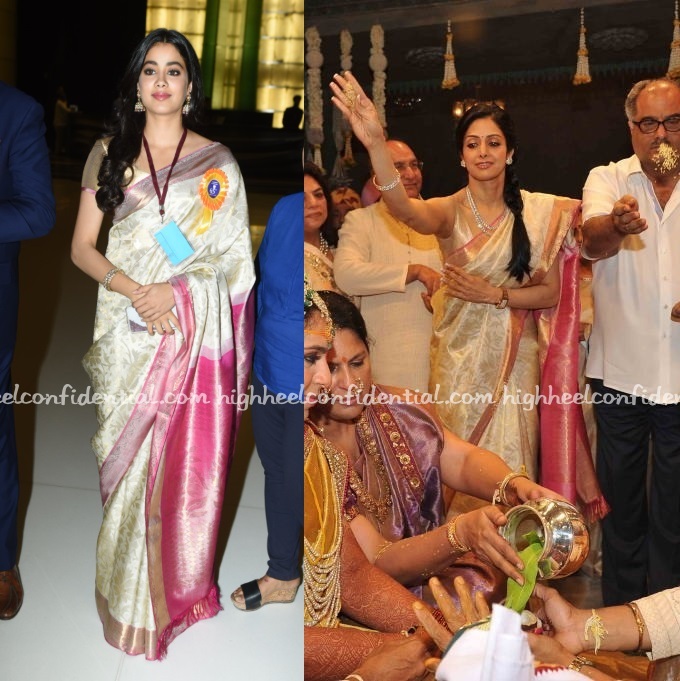 Janhvi carries that saree with so much grace esp given her age. I am slowly really liking her. She has an inner silent strength and alot of presence. Looking forward to seeing her on screen… her posters have alot of energy. jhanvi looks great! I couldn’t wear those heels though…I’m just scared looking at them. Both the girls look lovely. Khushi looks a lot like teen Sridevi in the half saree. I can’t imagine the emotions they would have gone through. Wishing them peace and healing. 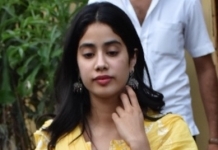 Jhanvi look exactly like her mother … her picture went viral on instagram at first glance I thought it was sridevi !!! I lost my mom the very next day Sridevi passed away..the void it leaves is incomparable..I can so relate to thier pain..this is a very courageous step from them..wish them peace and strength.. So sorry for your loss, Sam! Our condolences and best wishes! my condolences to you …hope you find your peace with your angel watching over!! Jhanvi carries the sari well , those r super high heels!!! Wish Khushi had opted for a sari instead of the half sari. They both look lovely and are dresses appropriately for the occasion. It mustn’t have been easy for them, kudos to the whole family for being so graceful and poised. They look gorgeous….such an emotional moment….feeling sad thinking about Sridevi. Good luck to the girls’ future. And kudos to their courage. Not feeling appropriate to comment on their clothes right now.